Visit Ganon Baker Basketball. Also see "An Interview with GanonBaker". Drop hips, head on chest of offensive player, step slide toes, mirror offensive players feet. 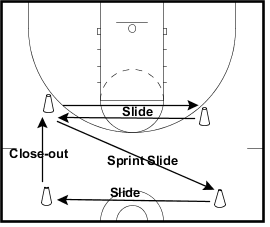 Step slide cone to cone , then sprint slide to cone, step slide, then closeout all in a square. You can use a smaller area as depicted in the left-hand diagram below, or a larger area (more aerobic) as seen on the right. Offensive players are on the 3-point arc and all have a ball. 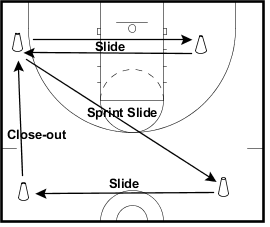 They dribble stationary in place, with the defender in the lane. The defender (X5) closes-out on a player and then it is live 1-on-1. If the offense misses and defense gets the rebound, defense gets 1 point and the drill keeps keeps going, with the defender picking another offensive player and closing-out. If the offense scores, the offensive player now becomes the defender.